While I'm a huge fan of Comics, TV Shows, and Movies, I honestly don't have ample amount of money to spend on collectibles. Comics are a little easy because they run between $1-$5 each, TV is free (at least while I'm still living with my mom >.< ), and I use coupons and go on Tuesday cheap day to the movies. Anything $10 or less is reachable on the spot, but anything more not so much unless it has multiple uses. Can I use it every day? Can I wear it and then display it? Or is it something I can wear on a regular basis? Will it benefit me in the long run? Yes, sometimes you have to live for today and splurge a little, but 90% of the time I have to think frugally. While yes you can take the easy way out and pay $30 to $50 for a fully made costume with ring and mask included. Remember to read the reviews before you purchase them. For me this is a one time use option (Maybe twice for Halloween), and it's not personal. After reading the comics and watching the cartoons, I've realized that each Green Lantern has their own styled suit. Do you really want to be like everyone else? It would be extremely awkward if the only two Green Lanterns in a costume party had the same suit! I want something unique, and it might not be after I post this, but you get the point! LOL! I'm working on building this costume to wear for Halloween and Paradise City ComicCon in December. The Two Most Important Things to be Identified as a Green Lantern is the Green Lantern Symbol for Will Power and the Green Lantern Ring! Any Green Lantern Shirt will work for the costume and guess what? You can wear the shirt everyday if you wanted to! Going to the movies, class, or the grocery store; it's fine to where anytime, anywhere. 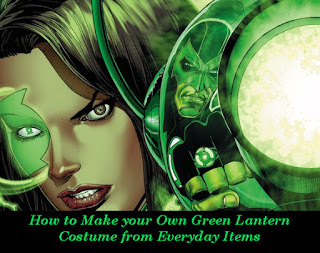 If you're a Fan of Green Lantern you probably already have one in your closet. Both rings are under $10 and they are cool to put on a shelf with my Flash Glasses and POP!s. When I go to make a purchase, I'll probably go for the Cosplay ring because it looks awesome, but I need to check my finger/ring size first. Simple Shoes and knee high or over the knee socks, depending on what you prefer. As you can see the stripes on the socks match the shirt, but there are a few other options on Amazon, or you can fold the over the knee socks until the stripes are gone and now you have a lip to your boots :D Again these are everyday Items you can work into your wardrobe and while green shoes aren't for everyone, as a UM Student, where we Bleed Orange and Green, Green shoes will fit right in! Now that we have all our green accents, we need the basics. You mostly like will have these things in your closet, so start digging them out! A Black Long Sleeve Shirt and Black Pants or Capris, again depending on what you're most comfortable with or what you already own. I have both pants and capris that work for this costume, but I really like the cargo capris (the Lee Woman's pair)! These, more than anything else, are truly versatile, they are staple items for any closet, and black is always in style! Now it's time for optional accessories. You can go mask-less, like Kilowog, or have white gloves like Hal. You can have a mask like Kyle, or go glove-less like John. You can also do your own thing, or add something from a character. I actually really like Jessica Cruz's symbol of Will Power over one Eye. 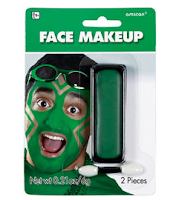 I can do that with some Face Paint! For Gloves, I'd like something simple. 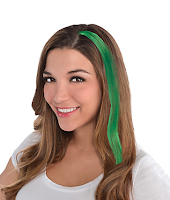 Lastly, I'd add a little splash of color to my hair! What's the cost for all these little things? Less than $8! I found them all at Party City in the Color Accessories Area. If you don't have a single item I listed here today, the costume will cost you about $95! For me, it'll be half that and only one of those items is more than $10, it'll be prefect in my collection of clothes though. It's all worth it in the end, and I can pay in small amounts, rather than one lump sum for something I have to alter and fix. Have you done Cosplay, or do you have a cool Halloween costume you made?